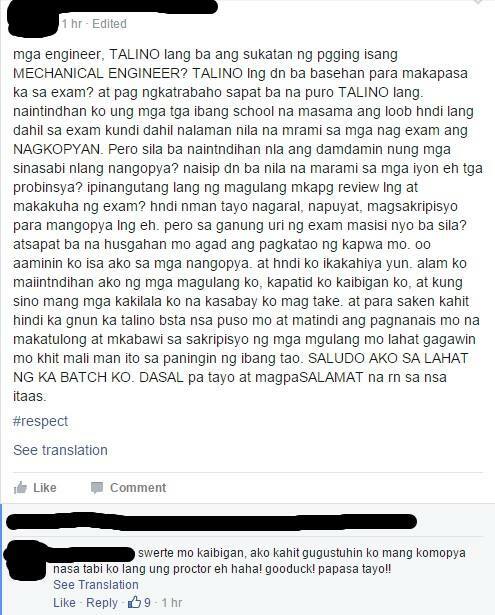 MANILA, Philippines - Some takers of the September 2015 Mechanical Engineering board exam admitted cheating as exposed in viral photos on social media on Sunday, October 4. 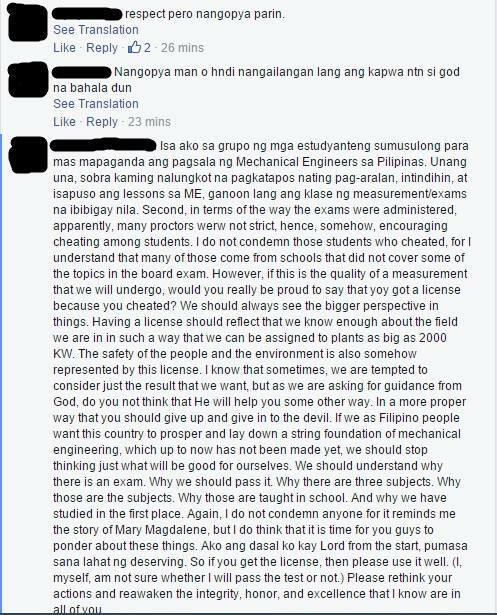 Screenshots of the conversation through Facebook claiming what was happened in some test centers of mechanical licensure exam were captured by George William Ong with his post captioned: "Nasaan ang dangal? Nasaan? ‪#‎MechanicalEngineeringBoardExam September2015‬." "Una looksfam, sunod solve ng madali, sunod solve ng mahirap at lastly ang mahiwagang circle of friends. haha, pag di ganyan ang ginawa mu nung exam, others ka. Haha..salamat sa mga katabi ko..at sa mabait na proctor na nasa tabi ko na kunwaring titingin sa bag at magtutulugtulugan para maka aura ako.hahaha," a netizen confessed online. "Kahit proctor naawa na din eh 30 mins nalang. la pa shade. Haha. Yung iba manhid pero kaya yan brad," one netizen said. One taker asked not to judge them because of cheating and said they also exerted effort in problem solving and have shared the answers to other examinees. Some also questioned how the recent ME board was administered. "In terms of the exam was administered, apparently, many proctors were not strict, hence, somehow, encouraging cheating among student." Some takers also defend the rationale of passing mechanical engineer board exam and summons for respect and understanding. In the official Facebook page of PRC, a certain Mhar Ilaga (not real name to hide his identity) shared his side on the issue. 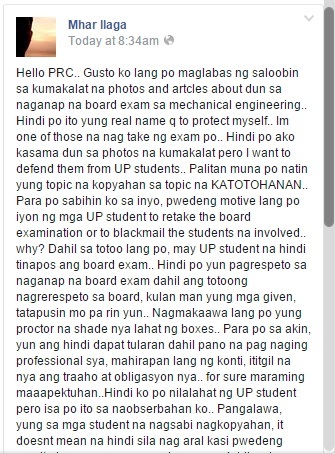 "Palitan muna po natin yung topic na kopyahan sa topic na KATOTOHANAN.. Para po sabihin ko sa inyo, pwedeng motive lang po iyon ng mga UP student to retake the board examination or to blackmail the students na involved.. why? Dahil sa totoo lang po, may UP student na hindi tinapos ang board exam.. Hindi po yun pagrespeto sa naganap na board exam dahil ang totoong nagrerespeto sa board, kulan man yung mga given, tatapusin mo pa rin yun.. Nagmakaawa lang po yung proctor na shade nya lahat ng boxes." Aside from cheating, takers also highlighted the fault of the Professional Regulation Commission (PRC) and the Board for Mechanical Engineering who have conducted the licensure exam. Allegedly, there are discrepancies in the testpapers as needed tables (i.e. Steam table, Mollier diagram) according to instructions on Day 1 exam were not provided. They just discovered that supplement data sheets were attached on test papers for Day 2 exam. This caused panic to some takers, pushed them to cheat while some students 'walked-out' of the test center. The September 29-30 Mechanical Engineering (ME) board exam results should have been released after 2 or 3 working days or on Friday or Monday per PRC Resolution No. 2014-874. It is possible that PRC and the Board of Mechanical Engineering are now investigating on the alleged cheating and the mistakes on how the board exam was administered. TheSummitExpress will try to contact PRC to clarify the issue. This site is also open for the official statement of the agency.